BOULDER, Colo. (BRAIN) — Pro ‘cross racer Tim Johnson will once again lead the Ride on Chicago, a five-day fundraising ride benefiting PeopleForBikes. He will be joined by 25 riders, including journalists, athletes and business executives, and pedal from Minneapolis to Chicago from June 2-6. PHOENIX (BRAIN) — Steve Flagg got the audience’s attention at the IBD Summit Wednesday, pointing out the challenges that rampant discount pricing for parts and accessories from online vendors in the U.K. pose for distributors and dealers. JACKSON HOLE, Wyo. 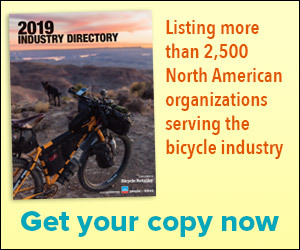 (BRAIN) — Some 250 advocates, land managers, U.S. forest service representatives and industry suppliers and retailers attended the fourth annual Global Fat Bike Summit here at the Snow King Resort this past weekend. MARINA DEL REY, Calif. (BRAIN) — The challenge of casting a wider net to continue to grow the sport of triathlon emerged as a key theme at Triathlon Business International's third annual North American Annual Conference held in Los Angeles this week. MADISON, Wis. (BRAIN) — SR Suntour North America is planning retailer drivetrain and suspension clinics, to be held Jan. 16 in Milwaukee and Jan. 30 in Cleveland. Both events are being held at Rays Indoor Bike Park locations and will include a lunch, riding opportunities and swag. PARK CITY, Utah (BRAIN) — Next year's PressCamp Summer event, the 7th annual, will be held June 22-26 at Deer Valley Resort in Park City. Goal of creating a ‘Manifesto of Change’ for the industry accompanies switch from spring in Monterey to winter date in Arizona. SAN JUAN CAPISTRANO, Calif. (BRAIN) — Interbike’s IBD Summit returns for its fourth edition in 2015 with a new Arizona locale, revamped agenda and a winter calendar date conceived to be more convenient for retailers than the event’s traditional April timing around “Monterey Week” and the Bicycle Leadership Conference and Sea Otter Classic in Northern California. LOUISVILLE, Ky. (BRAIN) — For its 2015 edition in March, the North American Handmade Bicycle Show will introduce a new category, the Artisan Award, and a cyclocross race pitting framebuilders against one another. SAN JUAN CAPISTRANO, Calif. (BRAIN) — Interbike and Bicycle Retailer and Industry News will host the second annual Turkey Pedal industry ride and food drive on Saturday, Nov. 15.